You don’t need to have a party to serve appetizers. In fact, I often make a variety of apps for supper. Finger food is fun and changes up the routine a little bit. In the May 2013 issue of Canadian Living there’s a feature called “There’s An App for That”. They had a few variations of stuffed mushrooms with one of them being Goat Cheese & Sun-Dried Tomato Mushrooms. I thought they looked interesting and weren’t like anything I’d served before. I usually make my stuffed mushrooms loaded with garlic and escargot. The Goat Cheese & Sun-Dried Tomato Mushrooms were really simple to make and take about 40 minutes to prep and cook. They were yummy and perfect party food. John still prefers my escargots but I thought these were pretty darn good! Stuffed with a creamy filling. An amazing appetizer! Remove stems from mushrooms; place caps, hollow side down, on foil-lined rimmed baking sheet. Brush with oil. Bake in 400°F oven for about 8 minutes. Let cool; drain off liquid. Place, hollow side up on clean foil-lined rimmed baking sheet. In a bowl, mash together goat cheese, cream cheese, sun-dried tomatoes, parsley, lemon juice and pepper. Spoon into mushroom caps. Bake in 375°F until golden, about 12 minutes. These sound amazing! We love mushrooms and goat cheese! Yummers! I will use vegan options for the cheeses, but otherwise this is a perfect recipe! this recipe is sick! i love goat cheese love sundried tomatos, and love mushrooms lol! you cheated using all the good ingredients. 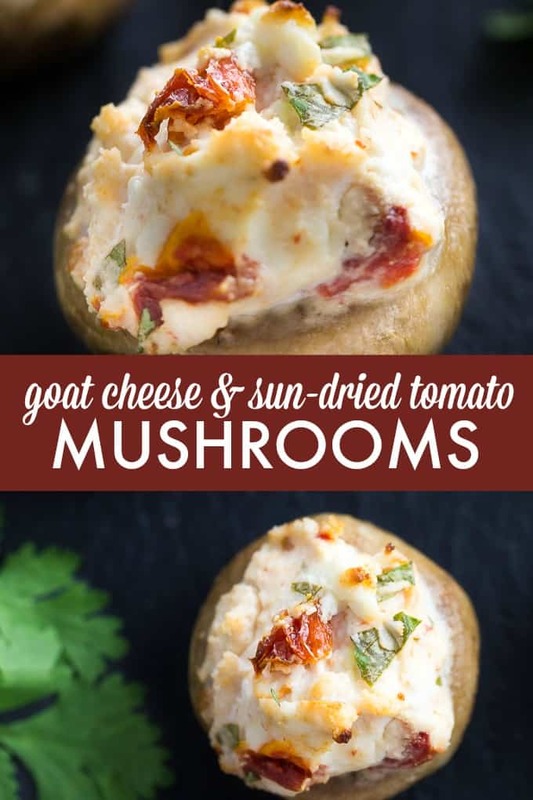 these look absolutely fabulous and I’m thrilled to find recipes using goat cheese. I’ve recently discovered that I don’t get ill on goat cheese like I do cows milk. great recipe, thanks! 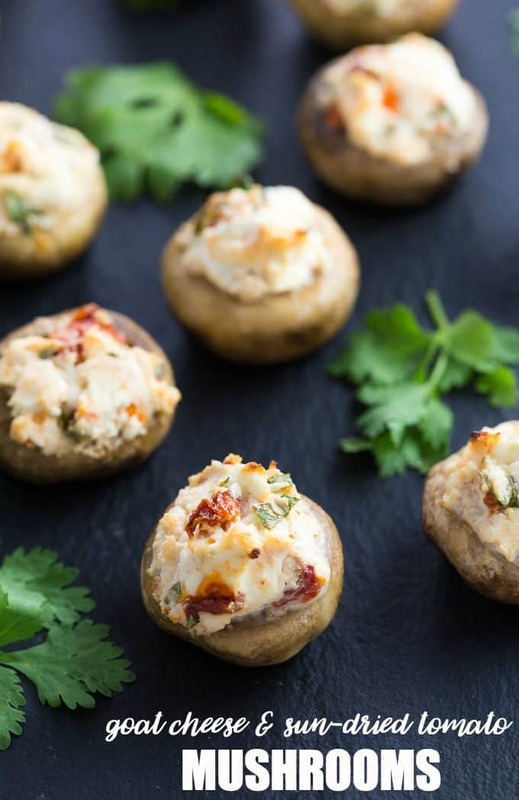 My husband Loves cheese stuffed mushrooms and he is going to really love this recipe. Yum! It’s nice to see a vegetarian stuffing for a change. Got used to seeing seafood stuffings 🙂 looks like a great recipe that we’ll be trying! These sound so yummy! Thanks for the recipe! These looks so tasty and elegant for a party appetiser. Love goat cheese. Thanks for the recipe share! YUMMMMMM!!! Looks like I will be going out to the grocery store after work for the ingredients tonight! These look wonderful and their is a good sale on mushrooms this week. I wonder if they would freeze? Do you think you have to bake the mushrooms first? 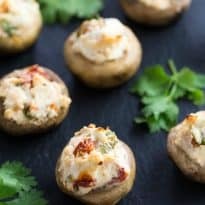 I make stuffed mushrooms a lot and don’t prebake them, but maybe because of the cheese, it would be too melted by the time the mushrooms were tender enough. I think that’s why they want you to pre-cook in this recipe. You could try it though! These look so good! I’ve been looking for an appetizer recipe for this weekend, I’m having friends over for dinner. This will be perfect! Thanks for the recipe! Those look tasty, and cute! These look so yummy. A perfect summer appetizer. I love these! What a perfect appetizer. Look like tantalizing canapes….I Pinned. These look so good! I’m going to pair them with a green salad for lunch. These look good!! Thank you for sharing the recipe! Yum, Stacie!!! These look amazing! Can’t wait to bring these to my next supper club! Have a great weekend! Oh yummy. These look so good. i do the same thing on Sunday alot. We call it Smorgasboard. Although it really isn’t. grocery. I am sure your recipe is soooo much better! Your mushroom appetizers look wonderful. Thank you for sharing your recipe at the Snickerdoodle Create~Bake~Make link party! These look phenomenal! I love stuffed mushrooms already but these take it to a new level. I can’t wait to give them a try. Thanks for sharing your recipe with us at Merry Monday!